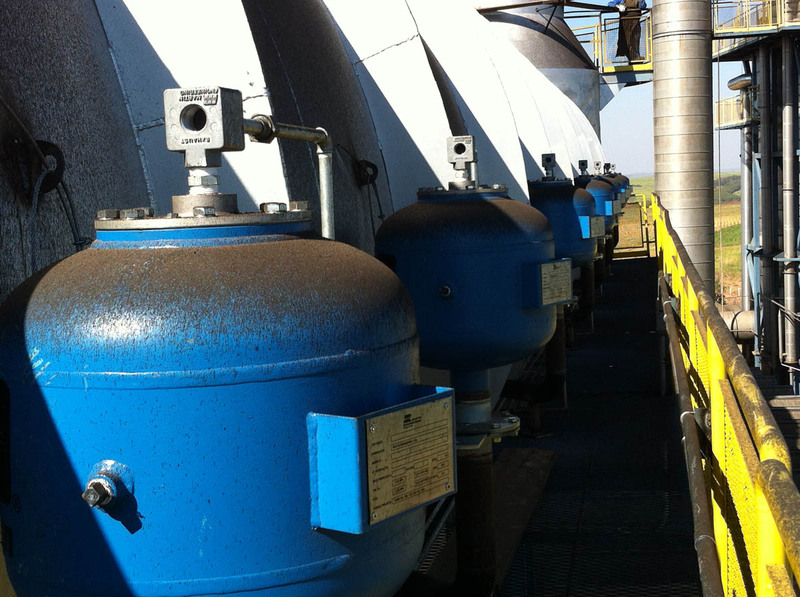 In 2009, Citrosuco, based in Matão, Brazil, switched from Brazilian petroleum fuel (BPF) oil to using a sugarcane bagasse hot gas generator or “gerador de gás quente” (GGQ). Threatening to offset the financial benefit of the change, excessive silica particle buildup in ductwork caused production to slow down and posed a potential hazard to workers. 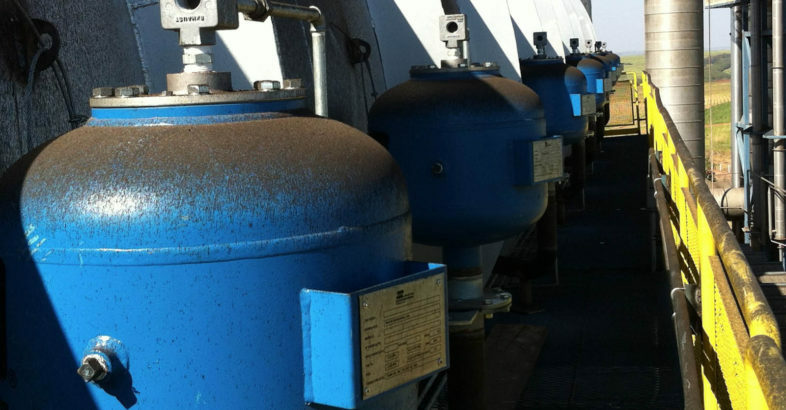 Martin Engineering Brazil devised an innovative flow solution using Martin® Typhoon Air Cannons that overcame extreme heat conditions, reduced material collection, improved safety and lowered the cost of operation. where they liquefied and accumulated at the base. to build within the system and posing a potential risk. “Over our production period we’ll burn about 420 tons of bagasse per day for the process,” explained Leonardo César Bolato, Senior Project Engineer for Citrosuco. “The dosage for firing is controlled according to the demand for heat by the process dryers.” Bagasse is a dense pellet made from the leftover dried husk of sugar cane, which is grown in soil with high silica content. Once burned in a GGQ, fly ash and silica particulates travel through an inverted U-shaped duct configuration. 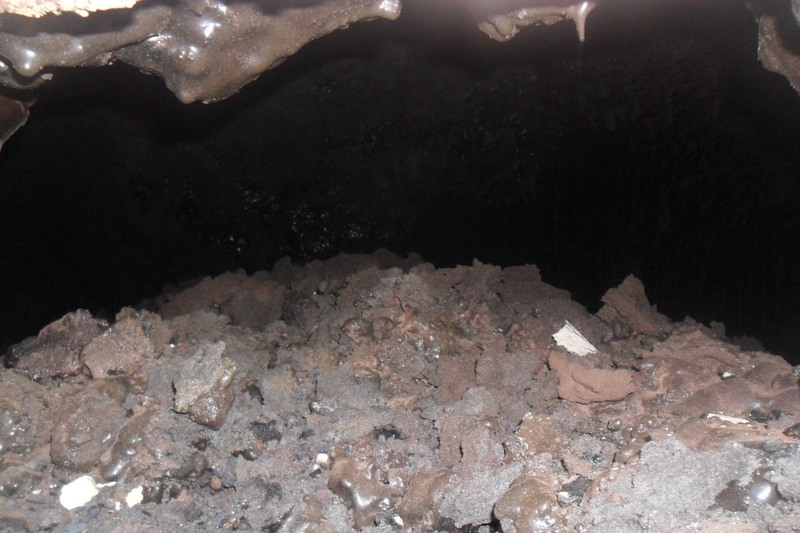 Though the fly ash traveled properly to collection points, silica particulates are too heavy for the pressurized heat flow to carry them, causing them to accumulate at the roof of the first curve in the ductwork. After being exposed to extreme temperatures for long periods, the silica liquefied and clogged the duct 90 percent, causing intense pressure to build within the system and posing a dangerous explosion hazard. This required the operation to be switched to burning BPF oil instead, the cost of which is more than 14 times that of bagasse. To clear the obstruction, the bagasse incinerator had to lay dormant for 4 days as the molten silica cooled and hardened. Workers would then enter the duct through a trap door, wearing specialized heat reflecting suits that allowed them to chip away the hard mass with pneumatic hammers. This process took roughly 4 days, because workers could only spend a limited amount of time in the duct. As they hammered closer to the core of the mass and exposed more molten silica, the heat forced crew members to rotate shifts to retain a healthy and safe environment. Counting the period needed to heat the system back to peak efficiency, the amount of downtime totaled approximately six weeks out of the company’s 7-month window. to promote the consistent flow of particles and gas. 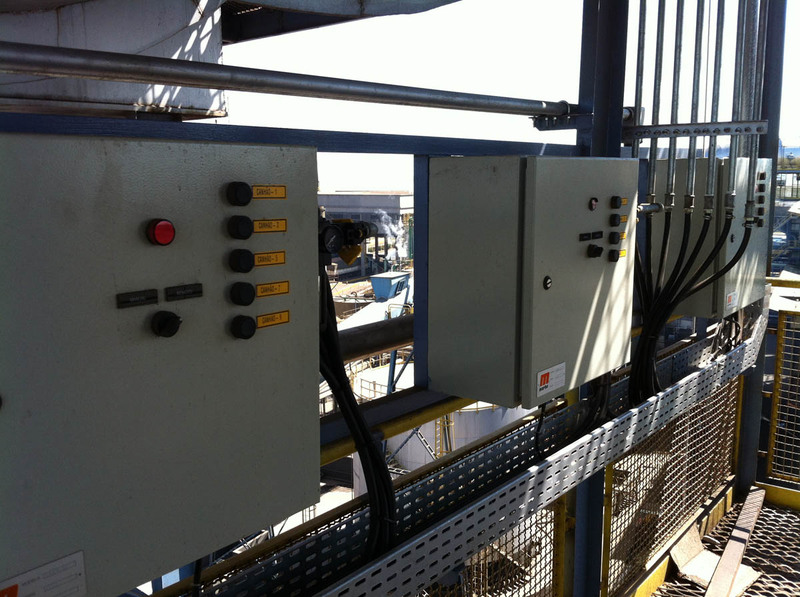 Company representatives visited several cement production facilities with similar needs for their calcination process and found that nearly all of the facilities successfully utilized Martin® Air Cannons. 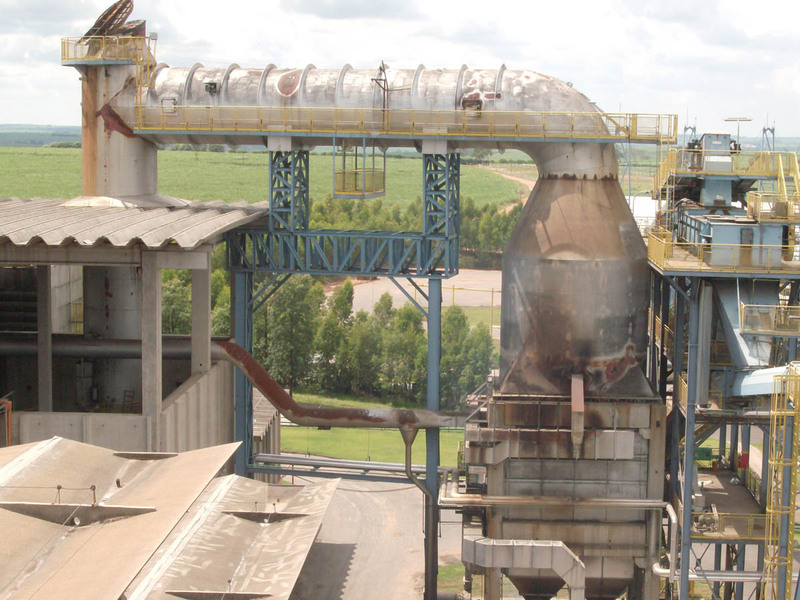 Although the cannons were in place to direct the flow of fly ash in those applications, the research team speculated as to whether the concept could be adapted to Citrosuco’s GGQ silica issue, so they reached out to Martin Engineering Brazil. “When I heard their needs, I realized that this was probably the first time that an air cannon might be used for such an application,” remarked Junqueira. The Martin Engineering team theorized that the silica particulates, though heavier, only became liquid after they had settled and if the particles could be kept flowing through the system with the fly ash, the silica would naturally come to rest in designated collection areas. The hybrid design of the Typhoon Air Cannon offers an improvement on negative pressure firing systems by combining the simple one-line plumbing of traditional valve design with the power, efficiency and easy maintenance of an advanced internal valve. Supplying more force output with less air consumption than traditional air cannons, the complete valve assembly can be removed in one easy step and replaced within minutes, working from one side of the tank, eliminating the need to remove the tank from the vessel for service. The schedule is maintained 24 hours per day throughout Citrosuco’s entire production window. Halfway through their third season of use, operators have reported no unscheduled downtime, no need to use fuel oil and only minimal post-season silica buildup since the conclusion of the project. Founded in 1944, Martin Engineering is the global leader in making bulk materials handling cleaner, safer and more productive. The company supplies conveyor products and flow aids around the world for a wide variety of bulk material applications, including biomass, grain, pharmaceuticals, food, coal, cement, and other materials. The firm is headquartered in Neponset, IL, offering manufacturing, sales and service from factory-owned business units in Brazil, China, France, Germany, Indonesia, Mexico, South Africa, Turkey, India and the UK, and under exclusive license with ESS Australia. For more information, visit or call (309) 852-2384. Global representatives for Martin Engineering can be found at www.martin-eng.com/rep-finder. It’s interesting to learn that when it comes to keeping a consistent flow of particles and gas through a machine that a factory might consider wanting to use an air cannon to help. This makes sense because then they are able to get the size of tank that they want to help keep things moving based on the size of their machine. It’s great to see that they are doing all they can to make things running smoothly.